TO Design wins the 2017 Connecticut Building Congress Project Team Award for work performed at the Gateways at Elizabeth Park in Hartford, CT.
On March 1, 2017, TO Design, LLC was honored by New Britain Mayor Erin Stewart in a special proclamation ceremony at City Hall, in honor of our 30th anniversary. 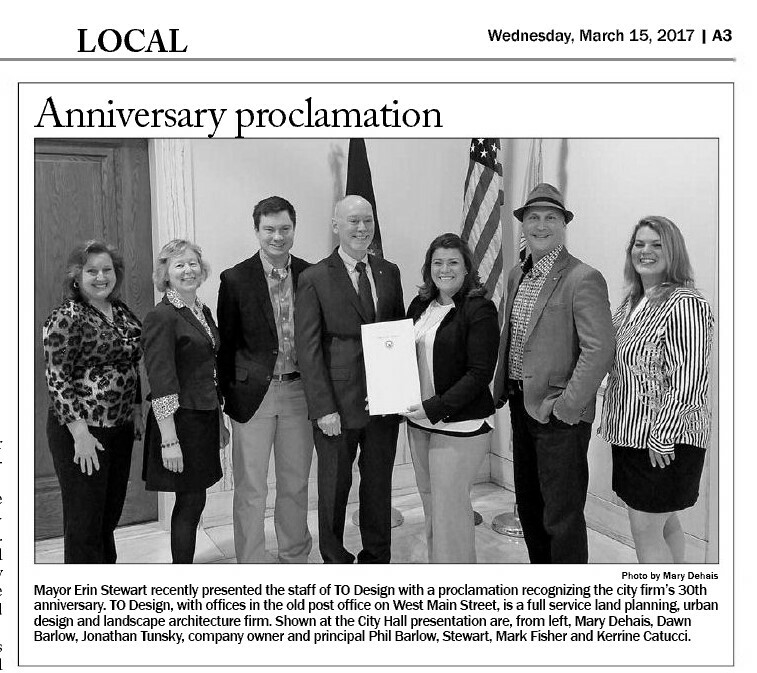 Thank you Mayor Stewert for the honor and for proclaming March 1st as TO Design Day! If you haven’t seen much of Phil this year, it’s because he is at the University of Connecticut - Storrs Campus two mornings a week. 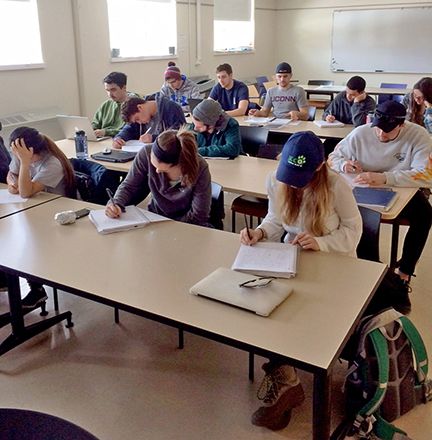 From now until the end of the semester, Phil is teaching a class in the Landscape Architecture department. He has graciously agreed to fill in for Kristine Schwab, Associate Professor of Landscape Architecture, while she is on sabbatical. From all reports, Phil is enjoying his time with our future CT landscape architectural professionals. When you see him, ask him about LAND 3230W - Environmental Planning and Landscape Design! 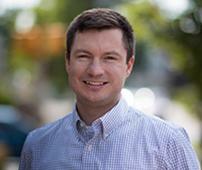 Jon Tunsky recently joined The Bishops Corner Neighborhood Association as a board member. This board is comprised of local residents, businesses, non-profits, and advocates, and is responsible for beautification of Bishops Corner, increasing pedestrian and bicycle safety, facilitating communication with residents, businesses and not for profits, and playing an active role in redevelopment projects in Bishops Corner section of West Hartford. Jon will make an excellent addition to this board and bring his expertise of landscape architecture to the forefront. Please join us in congratulating Jon on his new appointment! Now that the new year is upon us, TO Design, LLC looks back on some of our most treasured moments of 2016. Thank you for sharing these projects and events with us. May 2017 bring joy, peace, and happiness to you and your entire family. Happy New Year! 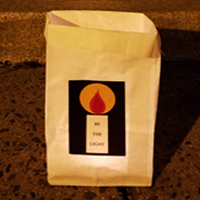 In support of the Friendship Service Center (FSC) of New Britain, TO Design lit thirty (30) luminary bags outside our office last night, December 21st – the longest night of the year. FSC marks this milestone to memorialize those who are homeless and have passed away during 2016. The luminaries are meant to call attention to the issue of homelessness. Much of our business is devoted towards providing quality housing to Connecticut residents of all social and economic backgrounds. Our work ranges from the rehabilitation and restoration of existing communities, to the implementation of new strategies for affordable housing. Currently, we are working with FSC on a supportive housing project at 180 North Street in New Britain. It was our pleasure to support the Friends of the Friendship Service Center's "Be the Light on the Longest Night" campaign, shining a spotlight on this important issue. Our donation will assist those living at FSC’s shelter. Check out pictures of our Luminary Bag display. No job is too big or too small when it comes to serving those in need. On Tuesday, the TO Design team, in conjunction with Hands on Hartford, did their part to serve a delicious community meal to approximately 80 patrons at Christ Church Cathedral in Hartford. From preparing the feast, to hand delivering the meal to each person, to washing dishes, to serving seconds, we did it all! On Friday, TO Design Principal Phil Barlow attended the ribbon cutting ceremony of the newly completed Marcus Garvey Place. Appropriately named for this prominent national hero, this park is located on the corner of Granby and Cornwall Streets in the Blue Hills Neighborhood of Hartford and symbolizes a bright light in the community. At the dedication ceremony, Dr. Julius Garvey, son of Marcus Garvey, spoke of his father's legacy and what the opening of the park symbolizes for the community. TO Design is proud to have designed such a significant park in Hartford. 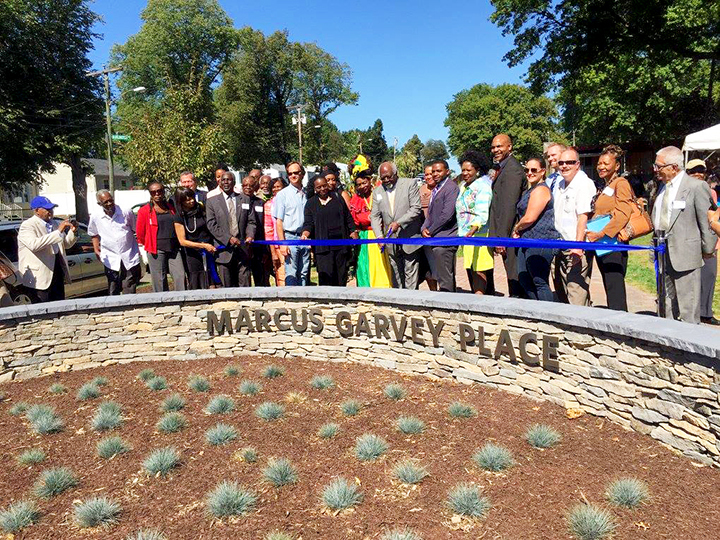 Check out pictures of the ribbon cutting ceremony of Marcus Garvey Place. 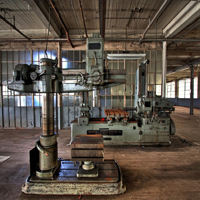 On Thursday, TO Design visiting the historic SWIFT Factory in Hartford to tour the factory and grounds. Led by Patrick McKenna of Community Solutions, we were guided on the remarkable journey of this once thriving gold leaf factory. Plans are underway to revive this historic site into a community asset providing jobs, a community food center and health services to area residents. TO Design is proud to be part of the team providing site design services. Check out pictures of our SWIFT Factory Tour. On Wednesday, Phil, Mark, Jon, and Tharyn explored Boston to experience the latest in park and play environment design. They visited the Rose Kennedy Greenway and the Boston Society of Architects (BSA) exhibit "Extraordinary Playscapes" at the Boston Architectural Center (BAC).